The good news about this post is that it is going to be short because there really isn’t much history to talk about. This post is a follow up to my previous post concerning fire on the summit. In that post I made the argument that fire was rare on the summit because of the high altitude, heavy snowpack and rocky terrain of the the Donner Summit are. At the time I wrote that post I did not really have the historical information to support my argument other than the fact that nobody that I talked to (including some of the old timers) could remember a fire in the area. Thanks to Linda Ferguson, a Fuels Specialist with the Truckee Ranger District, who sent me an historical map of wildfires in the area (see Figure 1), I now have the data to confirm the rarity of wildfires in the area. Consider the fire history map in Figure 1. Keep in mind these facts; The map only covers back to 1906 when record keeping started, and, Fire suppression in the area started in 1906. Granted that we really don’t know what the fire patterns were before 1906, it is clear that there have been many fires in the Tahoe National Forest since 1906. It is also clear that the Pacific Crest corridor, where Donner Summit is located, has been almost totally clear of wildfire activity. This goes along with the argument that fire is rare because of the natual conditions of the Sierra crest area. If we look at the Donner Summit area in more detail as illustrated in Figures 2 & 3, we see that in fact the largest fire recorded in the Sierra crest corridor did occur in the Donner Summit area. There were in fact two fires that occurred, one 1100 acre fire in 1908 and one 38 acre fire in 1954. To visualize where these fires actually burned I overlaid the contour map onto the satellite imagery in Google Earth and produced the map in Figure 3. The fire in 1908 was a relatively big one and it actually burned part of the Serene Lakes basin and was less than a quarter mile from what is now a residential area. We don’t know where the fire started or which way it spread but this fire does establish the point that a large wildfire can burn on the summit. I have no information on the causes of the 1908 fire but the only human activity in the summit area at that time was probably logging. The ignition source could have been related to a logging accident or it could have been a lightning strike. We also don’t know if the fire was actively fought or if it burned out on its own. The area was pretty remote in 1908 and fire fighting resources were scarce in those days, no aerial fire suppression bombers. The 38 acre fire in 1954 was located in the Palisade Creek basin where the Snow Mountain warming hut is currently located. This was probably ignited by a lightning strike. 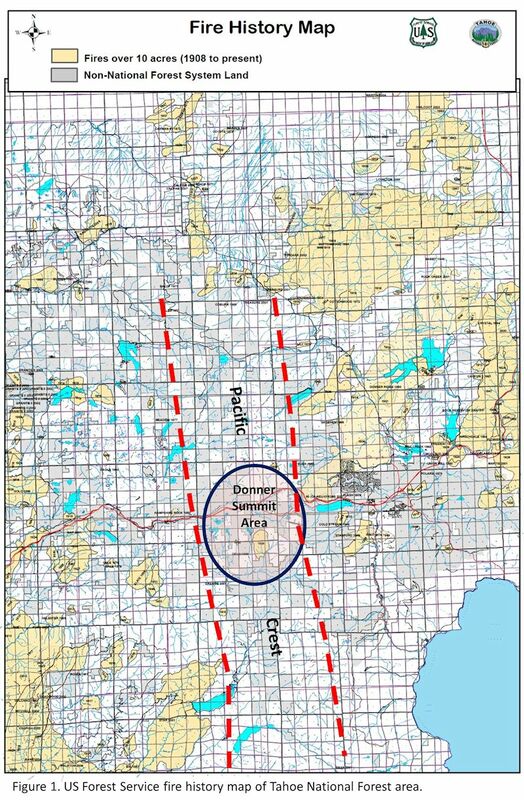 In 1954 the area was still very remote and it is unlikely that firefighters at the time would have been able to get to the fire quickly. It is likely that the fire probably burned itself out. My interpretation of these maps is that they are good news for the summit area. The fact that only one significant fire has started at the summit and that was 115 years ago demonstrates the rarity of large wildfires. As I discussed in my previous article, it would probably take a combination of a couple years of drought in combination with dry hot conditions for a big fire to get started in the summit area. The fact that there have been no big fires to north of south of the summit area in recorded history is also good news. It means that it is less likely that a fire will start outside of summit area and then migrate in. While the lack of fire in the area is good news, it does not mean that the summit is off the hook. In fact, because there has been no large fire in the area for over 100 years, it means that the fuel loads in the area have grown dangerously high. Data from the Onion Creek Experimental Forest indicates that forest densities are double what they would be if there were normal fire cycles. The big unknown is what the effects of global warming will be on the summit area. Less of a snowpack could mean much dryer summers, and longer, hotter summers would mean more volatility in our forests. 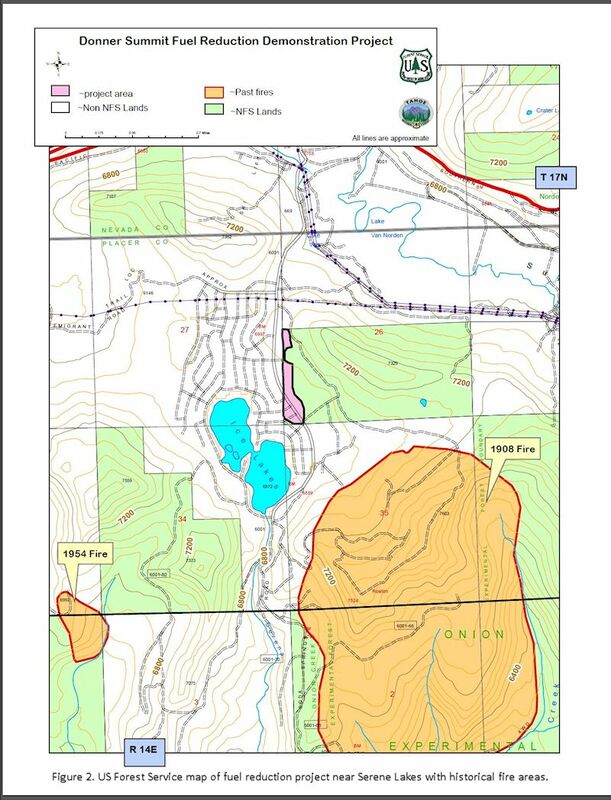 The efforts that underway by the US Forest Service, SLPOA and the Truckee Donner Land Trust to thin the forests in the area of their excessive fuel loads should proceed at full speed. This is the only way we can insure that we can continue to make wildfires a rarity on the summit. Thanks George. I especially like the last paragraph. A significant part of my President’s letter this month is about the fire danger and the need to be especially vigilent. I note the over 100 years since the last fire and the build up of ladder fuels and dead limbs on the ground. I also put in a pitch to avoid fire pit burning this summer—-things are just too dry. It could be a very difficult summer with a lot of smoke from fires in the area. Many thanks for the research and maps! Thanks for posting this info. Good historical references. The fire in 1908 might explain the black fire scarring I see in old growth cedars in the Onion Creek area. I always wondered, did lightning strike all these trees? Myself, father, brother and uncle were camping in Sagehen in 1960 when that big fire happened. We were some of the last people to get out. Fires were burning on both sides of the little dirt road into Sagehen and both sides of Hwy. 89 as well. I 80 was closed/ old Hwy 40. We had to drive to Reno and Carson City to get back to the bay area. I still see the fire scarring on the trees in Sagehen today. Stumbled on this article. 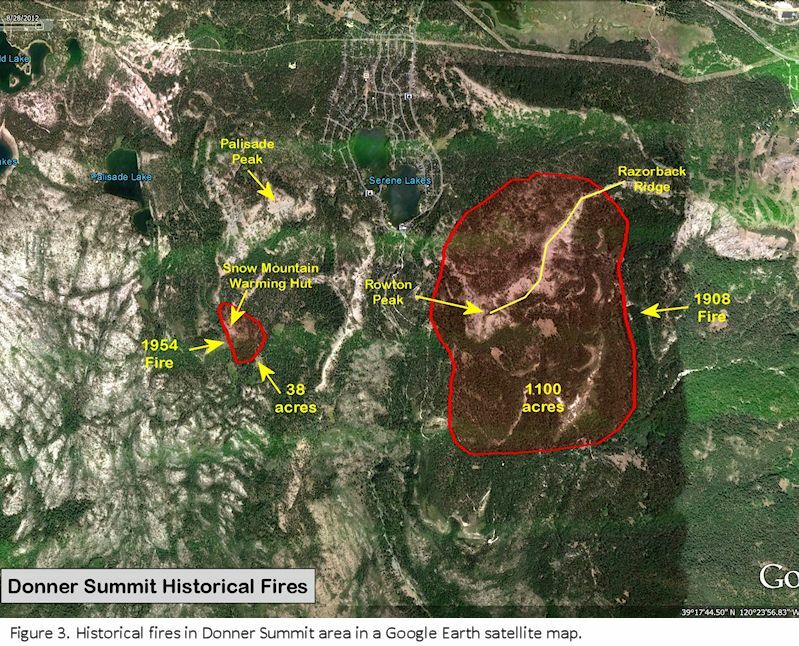 At first blush, I was astonished that no mention was made of the devastating August 1960 Donner Ridge Fire, but after reading the article again, I see that the focus was on Donner SUMMIT area. The Sept. 2014 posting by Suzanne above I believe references this 1960 “freeway” fire. (See my Dec. 2015 article on the Donner Ridge Fire in our Truckee-Donner Historical Society newsletter, https://bit.ly/2TOtIIy , and online references https://bit.ly/2RNqc41 ). While there may have only been the 1908 and 1954 fires that have documentation available, any fire starting in this Summit area, with even the slightest west wind could ignite another inferno like the Aug. 1960 fire that decimated so much of the Tahoe Donner area. Thank you for posting this.